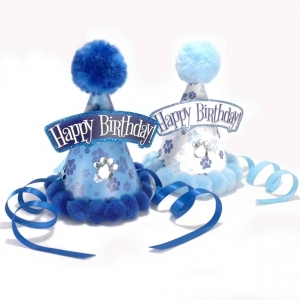 Pom-Poms and Paw Print Jewels! 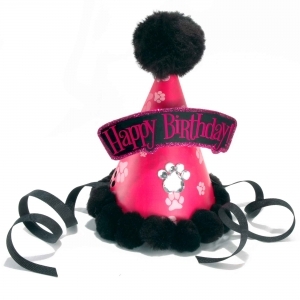 Nothing makes your dog's birthday party photos more fun, or the star of the party more stylish, than a colorful party hat. 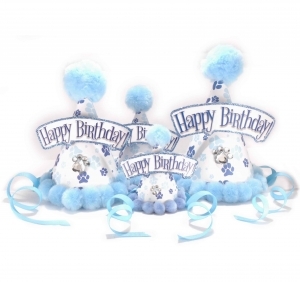 They come in four sizes, with grossgrain ribbon chin straps, paw print jewel bling, pom-poms all around and a Happy Birthday glitter marquee. Our hats for dogs are specially designed with ear cutouts to help them properly fit between your dog's ears. We are always happy to try to fill special requests, just ask! 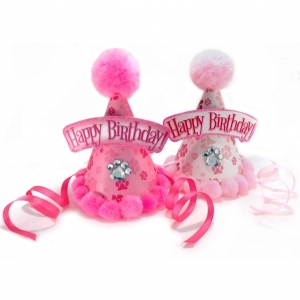 Pom Poms exact color, size and type may vary. * Terms & Conditions: Orders typically leave our facility within 72 business hours of the time the order is placed. See our business hours below. 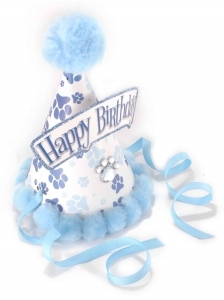 If you have a rush order, you must call The Dog Treatery prior to placing your order to make special arrangements. USPS Priority Mail typically takes two to three day in the 50 United States. That is not a guaranteed time frame and USPS can take up to seven days. We cannot guarantee the delivery date or time with USPS. We do not give refunds for items that were delayed, misdirected or otherwise mishandled by USPS. Business Hours are M-F 9-6 and Sat 9-1, Closed Sundays and all National Holidays.